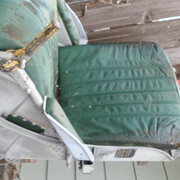 Friend with F-86E Fighter Seat wants to sell (seat only). I don't have all the details, I need to take some photos and info from it. I looked at it, took photos. it has been outside a while. I turned out it is most likely from an F-86E. The year on the tag is 1966. I can't tell you any more, but the owner can. He got it from someone that lead projects at Skunkworks a long while back. Someone mounted wheels on it to wheel it around on floors. 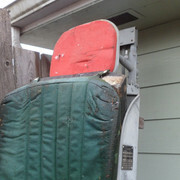 Attached are photos of it. Also photos of the manufacturing tag. In Oregon. Price not yet established. You pickup.